California Gov. Jerry Brown signed a law prohibiting minors from being subjected to a form of therapy that seeks to change a person’s sexual orientation from gay to straight, reports the Los Angeles Times. The law, the first of its kind in the country, is a major victory for gay rights activist who, like the vast majority of mental health experts, insist the so-called conversion therapy, also known as reparative therapy, isn’t based on science and could be dangerous. The bill specifically prohibits anyone under 18 to undergo any efforts to change his or her sexual orientation, reports Reuters, noting that it got support from the California Psychological Association and the California Board of Behavioral Sciences. The California Psychological Association and the California Board of Behavorial Sciences are dominated by liberals and homosexual activists. I was born there and got out before the crazies took control. The Obama administration's plan to transfer $450 million in cash to Egypt hit a roadblock Friday as a top House committee chairwoman blocked the move, saying it warrants further review. Rep. Kay Granger, R-Texas, said the State Department had notified Congress of plans to move the money to the new government of President Mohammed Morsi as Cairo struggles economically. The money is part of the nearly $1 billion in debt relief that President Barack Obama had promised Egypt earlier this year. "This proposal comes to Congress at a point when the U.S.-Egypt relationship has never been under more scrutiny, and rightly so," the chairwoman of the Appropriations subcommittee on foreign operations said in a statement. "I am not convinced of the urgent need for this assistance and I cannot support it at this time. ... I have placed a hold on these funds." The relationship between the United States and Egypt has been rocky since the overthrow of U.S. ally President Hosni Mubarak last year. The Egyptian government angered Washington when it cracked down on numerous democracy advocates and groups, including three U.S.-funded nongovernmental organizations, earlier this year. More recently, demonstrators breached the U.S. Embassy in Cairo to protest an anti-Islam video, and some in Congress have called for cutting off aid. The United States provides Egypt with $1.55 billion annually - $250 million in economic aid and $1.3 billion in military aid. After three meetings the Crown Nominations Commission remains unable to present Prime Minister David Cameron with 2 names, a first choice and an alternate, for Rowan Williams' successor as Archbishop of Canterbury. Today the Church of England press office released a statement at the close of the three day meeting of the Commission that indicated it had not been able to agree upon a candidate. Likely, the Commission will have to meet again. The names will be passed to Her Majesty, Queen Elizabeth the II, for a final appointment of the 105th man to sit on the throne of St. Augustine of Canterbury. This is yet another indication of how sorely divided the Church of England is, and many believe it will not be able to continue as a unified ecclesiastical body. There is disagreement on doctrine, women bishops, gay and lesbian clergy, and no shared vision of the future. John Milbank has written, "What is essential is that the Crown Nominations Commission does not sacrifice vision to efficiency - lack of the former, at this juncture, could prove disastrous. I remain optimistic though, for . . . there are several able potential candidates, and more crucially, among the younger generation, real signs of Anglican revival, on both the Anglo-Catholic and Evangelical wings. All the while, whiggish liberalism in the Church of England continues its rapid and inexorable decline." Milbank is Research Professor of Politics, Religion and Ethics at the University of Nottingham, Director of the Centre of Theology and Philosophy, and Chairman of the ResPublica Trust. Is Ahmadinejad's fiery speech before the UN a "prophecy" he intends to bring to fulfillment? 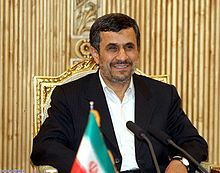 Iranian President Mahmoud Ahmadinejad on Wednesday called for the end of the “hegemonic” powers of the United States and Israel, whom he described as “the uncivilized Zionists.” He said the world would ”soon” see new “global management” by the Twelfth Imam, also known as the “Mahdi,” and his deputy, Jesus Christ. It is disturbing that the President of the United States speaks against Iranian Nukes, but not against this incendiary kind of speech. When Obama said that the future doesn't belong to those blaspheme the Prophet, was he saying that those who are not Islamic have no future; should this be taken as a threat? 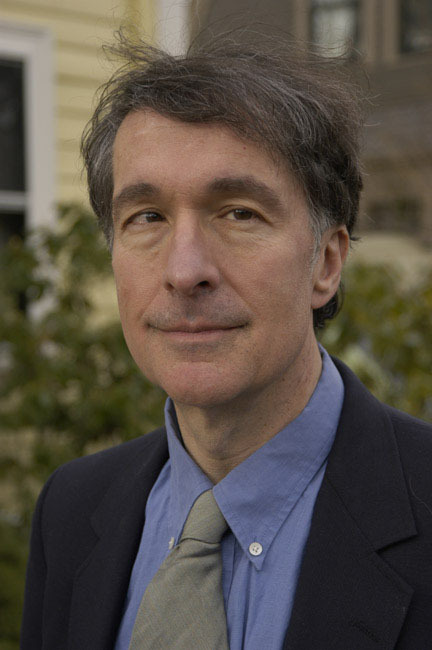 Writing in the New York Times, Harvard Professor Howard Gardner proposes a revision of traditional morality. "For millennia, religious believers have attributed our nature to God’s image, as well as to God’s plan. In recent years, evolutionary psychologists peered directly at our forerunners on the savannahs of East Africa; if human beings change, we do so gradually over thousands of years. Given little or nothing new in the human firmament, traditional morality — the “goods” and “bads” as outlined in the Ten Commandments or the Golden Rule — should suffice. My view of the matter is quite different. As I see it, human beings and citizens in complex, modern democratic societies regularly confront situations in which traditional morality provides little if any guidance. Moreover, tenable views of “good” and “bad” that arose in the last few centuries are being radically challenged, most notably by the societal shifts spurred by digital media. If we are to have actions and solutions adequate to our era, we will need to create and experiment with fresh approaches to identifying the right course of action." "tenable views of 'good' and 'bad' that arose in the last few centuries are being radically challenged, most notably by the societal shifts spurred by digital media. If we are to have actions and solutions adequate to our era, we will need to create and experiment with fresh approaches to identifying the right course of action. Let's start with the Ten Commandments..."
Gardner's premise is flawed, so therefore is his conclusion. Evolutionary biologists have had to admit that those archaic ancestors of East Africa were fully human, sharing the same essence as modern humans. The etymology of the word horotely suggests the very opposite of how it is used by evolutionary biologists today. The term relates to Horus and fixed limits or boundaries between "kinds" (an essentialist view). This is not a popular concept among those who believe that chimps and humans have a common ancestor because they have similar anatomical and genetic structure, or that nurse sharks and camels have a common ancestor because they have a similar antigen receptor protein structure. For purposes of classification, the essentialist is willing to group similar species such as apes and humans in the same genus, but this does not mean they are of the same essence. Clearly they have different essences since they reproduce different kinds. Humans only reproduce humans and have done for the past 3 to 4 million years. There are fixed boundaries within the DNA code. While the similarity of humans to primates may suggest a common origin, a common ancestor(s) is not known to have existed in real time. Three to four million year fossils recovered in Ethiopia and Cameroon have been studied to reconstruct a picture of Lucy and her archaic people. These 3.2 million year old remains were found in Hadar, Ethiopia in 1973. For about 20 years Australopithecus afarensis was described as the earliest known “human ancestor species.” Australopithecus means “Ape of the South” and afarensis refers to the Afar Triangle of Ethiopia where the fossils were found. The first discovered skeleton of this population was named "Lucy" and she was described as an ape rather than a human. Australopithecus afarensis is the term coined by South African anatomist Donald C. Johanson for Lucy and her community. Johanson has since concluded that these were Homo, not apes, although the artists’ drawings in biology books still show them as hairy and apelike. What are we to make of the phrase “functionally like” – does it mean similar or identical? The evolutionary biologist will read this and stress similar structure as evidence of common ancestry. On the basis of similar anatomy humans and chimps are classified in the same genus. So why not admit, on the basis of similarity, that A. afarensis is human? Here we find a serious flaw in logic. When paleoanthropologist Jeremy DeSilva compared the ankle joint, the tibia and the talus of fossil "hominins" between 4.12 million to 1.53 million years old, he discovered that all of the hominin ankle joints resemble those of modern humans rather than those of apes. Chimpanzees flex their ankles 45 degrees from normal resting position. This makes it possible for apes to climb trees with great ease. While walking, humans flex their ankles a maximum of 20 degrees. The human ankle bones are quite distinct from those of apes. Using DeSilva's evidence no argument can be made that the fossils are similar to apes. They are not. Lucy and her community are not evidence of common ancestry of apes and humans. They are evidence that humans have had the same essence for millions of years. Related reading: Theories of Change and Constancy; What Makes a Good Society? The Most Rev. Robert Duncan, head of the Anglican Church in North America, spoke at St. Andrew Anglican Church in Versailles, Kentucky on the evening of September 25. About 200 people gathered to enjoy dinner and listen to His Grace. Congregations from 3 states were represented. Middle Class Death Tax returns on January 1, 2013. The death tax is currently 35% with an exemption of $5 million ($10 million for married couples). For those dying on or after 1 January 2013, there is a 55 percent top death tax rate on estates over $1 million. A person leaving behind two homes and a retirement account could easily pass along a death tax bill to their loved ones. The Obamacare Medical Device Tax begins to be assessed on January 1, 2013. Medical device manufacturers employ 409,000 people in 12,000 plants across the country. This law imposes a new 2.3% excise tax on gross sales – even if the company does not earn a profit in a given year. Exempts items retailing for <$100. The Obamacare Medicare Payroll Tax Hike takes effect on January 1, 2013. The Medicare payroll tax is currently 2.9 percent on all wages and self-employment profits. Starting in 2013, wages and profits exceeding $200,000 ($250,000 in the case of married couples) will face a 3.8 percent rate. The Obamacare “Special Needs Kids Tax” comes online on January 1, 2013. Imposes a cap on FSAs of $2500 (now unlimited). Indexed to inflation after 2013. There is one group of FSA owners for whom this new cap will be particularly cruel and onerous: parents of special needs children. There are thousands of families with special needs children in the United States, and many of them use FSAs to pay for special needs education. Tuition rates at one leading school that teaches special needs children in Washington, D.C. (National Child Research Center) can easily exceed $14,000 per year. Under tax rules, FSA dollars can be used to pay for this type of special needs education. This Obamacare cap harms these families. The Obamacare “Haircut” for Medical Itemized Deductions goes into force on January 1, 2013. Currently, those facing high medical expenses are allowed a deduction for medical expenses to the extent that those expenses exceed 7.5 percent of adjusted gross income (AGI). The new provision imposes a threshold of 10 percent of AGI. Waived for 65+ taxpayers in 2013-2016 only. In Pakistan 26 were killed, over a 100 wounded, uncountable number of vehicles burnt or destroyed, one Church burnt in Mardan in the North along with the school, a computer training center, houses of the clergy and staff, public and property worth billions destroyed and set on fire, and banks looted. Lawlessness and violence do not bring glory to Islam or to the Prophet Mohammed. ISLAMABAD: Up to 50 people were injured on Thursday as police clashed with thousands of protesters, some carrying banners of rightwing groups, demonstrating in Islamabad against an anti-Islam film. Law-enforcement personnel fired tear gas and live rounds as demonstrators, many armed with wooden clubs, tried to reach the capital’s heavily-guarded diplomatic enclave, home to most western embassies, including the US, British and French missions. The government called in the army to protect the enclave after protesters broke through a barrier of containers set up by police to block a road leading to the area. The demonstrators fought pitched battle around the diplomatic quarters with police and paramilitary personnel for hours. The crudely made ‘Innocence of Muslims’, produced by US-based extremist Christians, has triggered protests across the Muslim world since excerpts were posted online, and more than 30 people have been killed in violence linked to the film. An initial demonstration of around 1,000 in Islamabad grew to some 5,000 as protesters carrying flags and banners of Jamaat-ud-Dawa, Jamaat-i-Islami and Sipah-i-Sahaba, which is banned by the government, joined it. Police fired tear gas and live rounds which initially scattered the crowd. 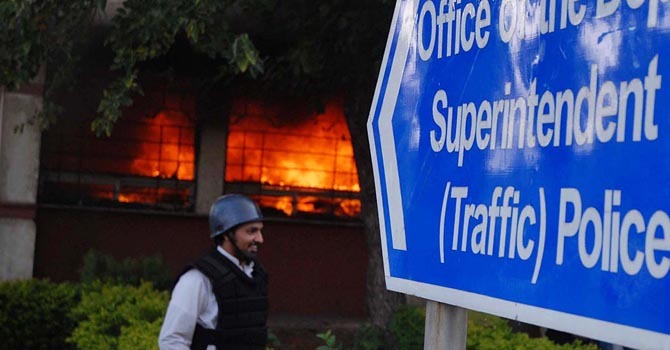 But the protesters returned to pelt police and Rangers with stones and breach the cordon, before torching a police post next to the nearby five-star Serena hotel. The luxury hotel, much used by visiting westerners, came under attack as a few demonstrators managed to enter the car park and damage vehicles, while others picked up tear gas shells fired by police and threw them into the hotel compound. 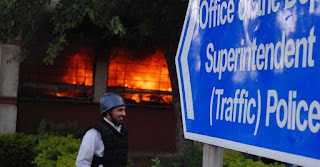 Doctor Razia Sultana of the Federal Government Services Hospital said at least 44 policemen and six civilians were injured in the clashes, with the majority of injuries caused by stones and tear gas shells. A boisterous crowd of around 4,000 held a rally in the eastern city of Lahore, while demonstrations were also held in several other cities of Punjab, including Gujranwala, Sialkot and Bahawalpur. In Quetta, thousands of students paraded on the main airport road before gathering outside the Quetta Press Club where they burnt US and Israeli flags. They also burnt down furniture and fixtures at a cinema house. Besides over dozen separate rallies and protest demonstrations in the provincial capital, thousands of people took part in demonstrations in the Chaman, Qalat, Pishin, Mastung and Noshki districts of Balochistan. Elsewhere in Balochistan, around 100 Christians denounced the film in their own protest in the border town of Chaman, where trucks supplying Nato troops cross into Afghanistan. They carried placards and banners that read: “We are with Muslims against blasphemous film” and chanted “Down with America”. Protest rallies were also held in different parts of Sindh and Khyber Pakhtunkhwa. BEIJING, Sept. 19, 2012 – Defense Secretary Leon E. Panetta and Chinese Vice President Xi Jinping both said at the outset of a meeting here this morning that the secretary’s visit to China will advance cooperation between the two nations’ militaries. Xi is widely considered as the top prospect to be China’s next president when the government transitions in 2013. He hosted Panetta at today’s meeting in the Great Hall of the People, just west of Tiananmen Square. Panetta responded that he is honored to visit China, as he was honored to host Xi at the Pentagon during the vice president’s visit to the United States in February. He added he appreciates Xi’s support in encouraging closer military coordination between the two countries. Speaking to U.S. and Chinese reporters later in the day, the secretary said the vice president -- who had been out of the public eye for some weeks before last weekend, and whose health had been the subject of intense speculation -- had been “very engaged” during their meeting. “We were scheduled to [meet] for about 45 minutes. We went a half hour or more beyond [that] in the discussion,” Panetta said. Panetta said he was impressed with Xi’s directness and believes the vice president sincerely wants to work toward a better relationship with the United States. Shortly after his meeting with Xi, the secretary gave a speech at the People’s Liberation Army Armored Forces’ engineering academy. He was the first defense secretary to visit the academy. Before leaving China, Panetta is scheduled to visit the eastern port city of Qingdao, where he will meet with the commander of China’s North Sea Fleet. Panetta began this trip to Asia, his third, with a stop in Japan, and will conclude the trip with a visit to New Zealand, the first by a U.S. defense secretary in 30 years. WASHINGTON, Sept. 14, 2012 – The State Department has identified the two security officers who died Sept. 11 in Benghazi, Libya, while helping to protect their colleagues. The attacks on the U.S. Consulate in Benghazi also killed U.S. Ambassador J. Christopher Stevens and Foreign Service information management officer Sean Smith, and wounded three other Americans who are recovering at the Landstuhl Regional Medical Center in Germany. The State Department previously identified Stevens and Smith. On Sept. 12, President Barack Obama issued a proclamation ordering U.S. flags to fly at half-staff until sunset on Sept. 16 in honor of Stevens, Smith, Woods and Dougherty. Obama, Clinton and Defense Secretary Leon E. Panetta today took part in a dignified transfer of the remains of the four Americans during a ceremony at Joint Base Andrews in Maryland. “Our thoughts, prayers and deepest gratitude are with their families and friends. Our embassies could not carry on our critical work around the world without the service and sacrifice of brave people like Tyrone and Glen,” Clinton said in the statement. Wood’s friends and colleagues called him “Rone” and relied on his courage and skill, honed over two decades as a Navy SEAL, she added. Woods had the hands of a healer and the arm of a warrior, she said, earning distinction as a registered nurse and a certified paramedic. “All our hearts go out to Tyrone’s wife Dorothy and his three sons, Tyrone Jr., Hunter and Kai, who was born just a few months ago,” the secretary said. “We also grieve for Glen Doherty, called Bud, and his family: his father Bernard, his mother Barbara, his brother Gregory and his sister Kathleen,” Clinton added. Doherty was also a former Navy SEAL and an experienced paramedic who put his life on the line protecting Americans in Iraq, Afghanistan and other hotspots, she said. “In the end, he died the way he lived -- with selfless honor and unstinting valor,” the secretary said. Clinton condemned in the strongest terms the attack that took the lives of the Americans, and said the United States is taking more steps to safeguard American embassies, consulates and citizens around the world. “The violence should shock the conscience of people of all faiths and traditions,” Clinton added. “We appreciate the statements of support that have poured in from across the region and beyond. People of conscience and goodwill everywhere must stand together in these difficult days against violence, hate and division,” she said. The secretary said she is enormously proud of the men and women who risk their lives every day in the service of the country. “We honor the memory of our fallen colleague by continuing their work and carrying on the best traditions of a bold and generous nation,” Clinton said. Four years ago, President Obama's campaign platform didn't include sweeping promises about promoting free speech. He wasn't elected because he swore to vigorously defend the First Amendment, and to protect speakers no matter the content of their speech. In contrast, the President did campaign on a platform of government transparency. As a transparency advocate, I can confidently say that, by almost any measure, the President failed to live up to those lofty guarantees. But what about free expression — a value so roundly cherished in the United States that a promise to support it would almost seem unnecessary? Without a clear benchmark or unambiguous campaign commitment on the issue, it's not so simple to assess his record. But sadly, like his commitment to transparency, the President's commitment to free speech was often collateral damage in his pursuit of other policy objectives. This was most evident in the administration's actions in two areas: intellectual property and national security. The administration's often misguided attempts at combating online copyright infringement frequently resulted in harm to protected expression. For example, in 2010, working in close cooperation with industry trade groups like the Motion Picture Association of America and the Recording Industry Association of America, the administration began seizing the domains of websites that government officials deemed to contain infringing material. Except that wasn't always the case: in at least two instances, the government seized — and refused to return — domain names without any apparent connection to copyright-infringing material. The seizures resulted in complete censorship of the sites for over a year. The same is true of the administration's heavy-handed treatment of Megaupload, an online file-hosting service. In January 2012, the Department of Justice seized Megaupload's domains and servers, froze its assets, and attempted to have the site's founder, Kim Dotcom, extradited to the United States to face criminal charges. While the site undoubtedly hosted some infringing content, there was also a vast amount of non-infringing content stored on the site's servers — family photos and videos, personal documents, and other protected expression. All this unquestionably protected speech was swept up in the name of combating online copyright infringement. While the administration's pursuit of intellectual property enforcement caused collateral damage to protected expression, the administration's biggest tests — and, subsequently, biggest failures — in its commitment to free speech occurred in the national security arena. National security concerns caused the Administration to investigate and charge government whistleblowers under the Espionage Act and led to the questionable prosecution of alleged terrorists for “crimes” as innocuous as translating YouTube videos and writing vulgar and hateful poetry. Yet nowhere were the administration's First Amendment failings more evident than in its handling of Wikileaks. After Wikileaks published thousands of confidential (and, in some cases, classified) State Department diplomatic cables, the administration embarked on an unprecedented intimidation campaign. In particular, the Department of Justice's long-running grand jury investigation of Wikileaks and its founder, Julian Assange, stands as a press-chilling stain on the administration's First Amendment record. The message the administration sent through its investigation is clear: if you publish classified information — and, in particular, classified information that portrays the government in an unflattering light — we may prosecute you. Classified information is published almost daily in the country's most reputable newspapers and magazines. Punishing the publication of truthful information about the government, absent a clear and present danger posed by the information's disclosure, is intolerable under the First Amendment. Yet this was precisely the administration's extraordinary approach. Indeed, the most enduring legacy of the Obama administration's commitment to free speech may be the long shadow in cast upon national security reporting. There were bright spots, however. The administration made promoting free expression abroad a focal point of Secretary of State Hillary Clinton's international agenda. For example, in a thinly veiled jab at China, Secretary Clinton stated, “Countries that want to be open for business but closed to free expression will find that this approach comes at cost[. ]” Secretary Clinton similarly called on regimes in the Middle East to ease restrictions on free expression. But these are the easy cases — it's not politically difficult to champion the rights of those living beneath repressive regimes. The true test of an administration's commitment to free expression can only come in relation to the closer cases — those that strike near home or that implicate other policy goals. Seen through this lens, over the past four years, the Obama administration often abdicated its responsibility to protect free expression in pursuit of more politically expedient goals. Archbishop Bob Duncan will speak to Central Kentucky and Tri-State area Anglicans on Tuesday, September 25. When Anglican church history is written, Archbishop Duncan's story will be told. He heads the fast growing Anglican Church in North America. I do not agree with him on the ordination of women to the priesthood, but I respect the way he has persevered through hardship, losses and personal attacks. Vladimir Putin says he doesn't use the internet very much. But he has definitely recognised its power. The biggest protest rallies in post-Soviet Russia, against Putin and his United Russia party, were organised online. No wonder that the parliamentary and presidential elections and Putin's inauguration were all marked by the hacking of independent media websites and LiveJournal, Russia's most popular blogging platform, via DDoS (distributed denial of service) attacks. Russian television is poisoned by censorship, and there are few offline platforms for public discussion. That is why social networks and blogs provide the space people from all over Russia use to share ideas and plans protests against Putin. The precedent for persecuting bloggers to silence them was set in 2008. A year after blogger Savva Terentyev criticised police in a comment on a LiveJournal post he was given a one-year suspended sentence, under article 282 of the Russian Criminal Code, for "fomenting social hatred" towards police officers. Since then, article 282, which covers actions provoking animosity and hatred towards certain religious, social, gender or national groups, has been used to silence bloggers through the courts. The other charge commonly used against internet users is "extremism". Throughout Putin's reign this charge has been used to target people who criticise the Kremlin - together with defamation and drug legislation. Russia's Department of Presidential Affairs won three defamation lawsuits against newspaper Novaya Gazeta in just one week last year. The newspaper's editor-in-chief, Dmitry Muratov, told Index on Censorship that the Kremlin has been using defamation suits as a censorship instrument. In late August, Taisia Osipova, a The Other Russia activist, was sentenced to eight years in prison on charges of drug trafficking. Rights activists have called her a political prisoner and connect her prosecution with her political activism - her husband is a member of The Other Russia political council. No fingerprints were analysed with the drugs Osipova allegedly held in her flat, and the three witnesses in the case were pro-Kremlin youth movement members. Starting on 1 November 2012 Russian authorities won't need a court ruling, like they did in the Terentyev case. Authorities will appeal to ISPs, create website blacklists and will be able to actually shut down anything they don't like. Previously, a court ruling could make a website or the URL for certain web content inaccessible in a specific region, while it stayed available in another. Andrey Soldatov, an expert on Russian security services, notes that soon "the Kremlin will have at its disposal the facilities for blocking access to internet resources across the whole of Russia", including Skype and Facebook. This is the result of the activities of the State Duma this summer. The period after Putin returned to Kremlin will stay in Russians' memory as a time of scandalous criminal prosecutions and controversial laws, which in spite of people's protests, were passed by the Duma. The internet blacklist law, perhaps more than any of the other new laws - against rally organisers, NGOs which are financed from abroad, and the law which re-criminalised defamation - is likely to cause the saddest and the biggest consequences for Russian civil society. Read the uncondensed version here. A new poll -- conducted for the online journal "The Hill" -- indicates that a majority of American voters think that the United States is worse off now than it was four years ago when President Barack Obama was elected, the Spero Forum website reports today (September 4, 2012). This majority asserts that President Obama does not deserve to be reelected president. The poll says that 52 percent of likely voters says the country is in "worse condition" now than in September 2008, while 54 percent say President Obama does not deserve reelection based solely on his job performance. The poll -- conducted by Pulse Opinion Research and concluded on September 2 -- found that only 31 percent of voters believe the U.S. is in "better condition," while 15 percent say it is "about the same." 4 September 2012 – As heavy fighting continues throughout Syria, the United Nations refugee agency today reported that the number of those fleeing to neighbouring countries rose to over 100,000 in August – the highest monthly total to date. According to the Office of the UN High Commissioner for Refugees (UNHCR), 103,416 people sought asylum in countries neighbouring Syria in that month, bringing the total number of Syrian refugees registered or awaiting registration as of 2 September to 235,368 – mainly in Lebanon, Turkey, Jordan and Iraq. Those figures include Iraqi refugees who had previously fled to Syria and are now returning to their homeland by the thousands, a UNHCR spokesperson, Melissa Fleming, told a news briefing in Geneva. According to the Iraqi Government, 35,000 people returned to Iraq in July and August alone. “Most tell us they are leaving because of general insecurity, although some have reported direct threats,” Ms. Fleming said, noting reports that three Iraqi refugees were killed last week in Jaramana, located outside of the capital, Damascus, increasing fear among the refugee population there. More than 18,000 people, mostly civilians, have died since the uprising against President Bashar al-Assad began some 18 months ago. There have been reports of an escalation in violence in recent weeks in many towns and villages, as well as the country's two biggest cities, Damascus and Aleppo. Ms. Fleming said UNHCR and the Syrian Arab Red Crescent continue to expand operations to support Syrians displaced both internally and abroad. Domestically, the UN agency has launched a programme of financial assistance, with 730 vulnerable families receiving cheques as part of a scheme to help some 35,000 families in the coming months. In Iraq, authorities in the Kurdistan region had agreed to the establishment of a second refugee camp that will mainly accommodate Syrian Kurds, arrivals of whom had been increasing significantly in the past week, along with smaller numbers of other Syrians, Ms. Fleming said. For returnees, the Iraqi Ministry of Displacement and Migration is expediting the registration process to enable them to receive government assistance for their reintegration. Some 2,000 families were registered in July and August as part of that effort. UNHCR is also assisting Iraqi returnees with household items and will soon start a small cash assistance programme for the most vulnerable returnee families. In Jordan, into which refugees continue to flow at a rate of about 1,000 a day, the Government, UNHCR and partners are preparing for an even larger influx, given reports of increasing numbers of displaced people in southern Syria. Ms. Fleming said that the first batch of 56 trucks carrying 13,000 tents and relief items, such as blankets, jerry cans and kitchen sets, for a total 150,000 people, arrived in Jordan from Dubai over the weekend to augment local supplies. In Lebanon, there are now more than 59,000 Syrians registered or awaiting registration with the UN refugee agency, Ms. Fleming said, adding that this week the agency is opening a mobile registration centre in the eastern Bekaa Valley. Host families and schools are increasingly stretched in their capacity to host refugees and UNHCR is appealing to authorities in Lebanon to approve alternative shelter options, she said, while the agency is also working to meeting the educational needs of the refugee children. Turkey, meanwhile, now hosts some 80,410 Syrian refugees, according to the Government. Ms. Fleming said that there was still a backlog at the border, with reportedly around 8,000 people waiting to cross and receiving assistance, while being admitted at the rate of hundreds per day. Ms. Fleming added that the Turkish Government continues to transfer Syrian refugees to the new camp in Karkamis, with over 4,000 people already transferred in recent days. Another new camp opened yesterday in Kahramanmaras. The spokesperson noted that the Turkish Government continues to assure UNHCR that it will keep its borders open to Syrian refugees. The German company responsible for manufacturing a drug that directly caused thousands of babies to be born with birth defects apologized Friday, 50 years after thalidomide was pulled off the market. Victims, often born with shortened limbs and missing arms and legs, quickly described the apology as insufficient, saying it was time for the company to begin paying out compensation, reports Reuters. The drug, a powerful sedative, was given to pregnant women to combat morning sickness but was pulled off the market in 1961 after thousands of babies were born with defects. The drug was never approved in the United States, points out the Associated Press. Is Biden Party to Rabbinic Intolerance? Vice President Joe Biden delivered a speech at The Rabbinical Assembly in May 2012 in which he painted President Obama as a great supporter of Israel. It was a political speech. It is doubtful that Biden knew or cares that the Rabbinical Assembly has targeted the children of Messianic Jews for conversion. The RA regards the children of Messianic Jews as apostates and proposes ‘aggressive’ conversion to Judaism, ignoring parental rights, freedom of religious choice, and family dissension, a charge the Rabbis often level at Christian missionaries. born of Jewish ancestry whose parents have led them astray. …those children of apostates are still technically Jewish. Jewishness is an ethnicity traced through the mother. To be Jewish one must be born to a Jewish mother. Judaism is a religion. To join Judaism one must properly convert to Judaism. None born Jewish is required to affirm Judaism. It is expected, but the matters of ethnicity and religion are separate. The Rabbinical Assembly has presumed soul-rights over all Jews. It intends to go after the children of Jews who regard Jesus as the long-awaited Messiah children. They will call it "rescue" but Messianic Jews will experience it as persecution. ISLAMABAD: A blasphemy case took a bizarre turn here on Saturday when police arrested Khalid Jadoon, a prayer leader who had allegedly put some pages of the holy Quran among the burnt papers to strengthen the case against a Christian girl. The arrest was made after a statement before a magistrate by a witness, Hafiz Zubair, a Muezzin in the same mosque, in which he alleged that he saw Khalid Jadoon putting the pages of Quran in the polythene bags containing the burnt papers. A heavy contingent of police raided the residence of the prayer leader after obtaining arrest warrants, picked him up and put him behind bars. The witness disclosed before an executive magistrate that the Imam of the mosque in Mehra Jaffer had included two pages of the Quran among burnt papers brought to him by the complainant in order to exacerbate the situation. He said he was sitting in Aitkaf in the mosque located in front of the house of the girl when complainant Malik Hammad brought the burnt pages in two polythene bags to the prayer leader. The witness said he tried to stop the cleric from tampering with the evidence, but he insisted it would strengthen the case and lead to eviction of the girl’s family from the locality. He experimented with sterilization in the camp. Part of Block No. 10 in the Main Camp was put at his disposal. Several hundred Jewish women from various countries lived in two large rooms on the second floor of the building. Clauberg developed a method of non-surgical mass sterilization that consisted of introducing into the female reproductive organs a specially prepared chemical irritant that produced sever inflammation. Within several weeks, the fallopian tubes grew shut and were blocked. Clauberg's experiments killed some of his subjects, and others were put to death so that autopsies could be performed. Like Clauberg, Schumann was searching for a convenient means of mass sterilization that would enable the Third Reich to carry out the biological destruction of conquered nations by "scientific methods"--through depriving people of their reproductive capacity. "X-ray sterilization" equipment was set up for Schumann in one of the barracks at Birkenau. Every so often, several dozen Jewish men and women prisoners were brought in. The sterilization experiments consisted of exposing the women's ovaries and the men's testes to X-rays. Schumann applied various intensities at various intervals in his search for the optimal dose of radiation. The exposure to radiation produced severe burns on the belly, groin, and buttocks areas of the subjects, and festering sores that were resistant to healing. Many subjects died from complications. The results of the X-ray sterilization experiments were unsatisfactory. In an article that he sent to Himmler in April 1944, titled "The Effect of X-Ray Radiation on the human Reproductive Glands," Schumann expressed a preference for surgical castration, as being quicker and more certain. Josef Mengele held a Ph.D. and a medical doctorate. In close collaboration with the Kaiser Wilhelm Institute for Anthropology, Genetics, and Eugenics, he studied the phenomena of twins, as well as the physiology and pathology of dwarfism. He was also interested in people with different-colored irises and in the etiology and treatment of noma ("water cancer" of the cheek). This latter disease, widespread in the Gypsy Camp, had been previously almost unknown in Europe. Mengeles first experimental subjects were Gypsy children. He had a laboratory in the so-called "Gypsy Family Camp." On Mengele's orders, children suffering from noma were put to death in order for pathology investigations to be carried out. Organs and even complete heads of children were preserved and sent in jars to institutions including the Medical Academy in Graz, Austria. Mengele also began selecting dwarves and persons with physical peculiarities (including inborn disabilities and the developmental defects that appear in dwarfism) from the Jewish transports brought to Birkenau for extermination, from the Jewish "Theresienstadt Family Camp" in Birkenau, and from the so-called Mexico (Sector BIII). In the first phase of his experiments, Mengele subjected pairs twins and people with physical handicaps to special medical examinations that could be carried out on the living organism. Usually painful and exhausting, these examinations lasted for hours and were a difficult experience for starved, terrified children (for such were the majority of the twins). The subjects were photographed, plaster casts were made of their teeth and jaws, and their fingerprints and toeprints were taken. As soon as the examinations of a given pair of twins or dwarf were finished, Mengele ordered them killed by phenol injection so that he could go on to the next phase of his experiments, the comparative analysis of internal organs at autopsy. "Scientifically" interesting anatomical specimens were preserved and shipped to the Institute in Berlin-Dahlem for more detailed examination. In 1941-1944, SS camp physicians Friedrich Entress, Helmuth Vetter, and Eduard Wirths carried out clinical trials of the tolerance and efficacy of new medications and drugs, with such code names as B-1012, B-1O34, B-1O36, 3582, P-111, rutenolu, and peristonu, on Auschwitz Concentration Camp prisoners. They did so on commission from IG Farbenindustrie, and particularly from the Bayer firm, which was part of that cartel. These preparations were given to prisoners suffering from contagious diseases, who had in many cases been deliberately infected.